Everyone is shopping online these days. From kids’ games to apparels and from laptops to mobile phones, people are shopping for most products online. Online shopping is being seen as one of the easiest and most convenient ways to shop for products, with shoppers choosing to shop online rather than making their way to a brick and mortar store to buy products. This is the reason why we are seeing more and more online retailers opening stores today; eCommerce has become big business, but it has also become intensely competitive. The question is – how can you ensure people buy from your eCommerce store and not choose to make their purchase from a competitor’s store? The best way to ensure that your eCommerce store gets noticed from the vast sea of online stores is to offer an incredible shopping experience to your customers. There are many effective and innovative features that can help eCommerce sites deliver a great user experience. Shoppers prefer trying the product before purchasing it to see whether it looks good on them or fits them correctly. One of the many limitations with shopping online is the inability to try on the product before purchasing it. This is one of the main reasons shoppers prefer brick-and-mortar stores to eCommerce stores, while buying apparel. But some eCommerce stores have begun offering ‘virtual try-on’ to get around this issue and deliver a better online shopping experience to their users. This feature helps overcome one of the biggest online shopping limitations for shoppers, which is trying a product before purchasing it. The virtual try-on program allows shoppers to try the product (clothes or any accessories such as eye glasses) on photos of different models or upload their own photos to virtually wear the product. This is a ‘must offer’ feature that can help your eCommerce store stand out from the crowd. BonLook, for example, is a well-designed site that raises the user-experience bar by offering the virtual try-on feature. Apart from uploading a photo, it offers an option of using a webcam which allows visitors to try-on glasses and get 180 degree views of how these glasses look on their face. There are certain items that aren’t used regularly, for e.g. camping gear. These are items that one uses once or twice a year or perhaps seasonally and they are then stored somewhere safe for the rest of the time. Rather than buying such items, wouldn’t it be better to rent them? E-commerce stores should provide such items for rent to users, which once used can be returned back. This feature will be much appreciated by users as it will help them save a lot of money. 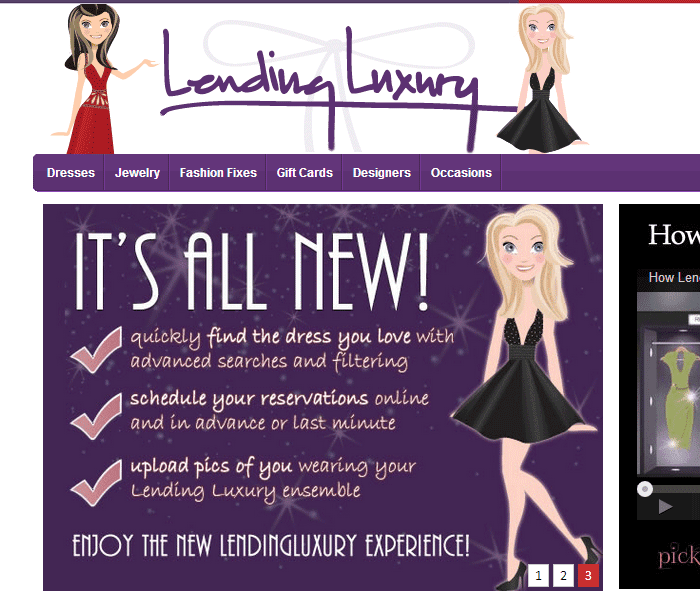 Lending Luxury, a members-only website, offers the inexpensive alternative of renting to women who don’t want to pay the full retail price for a dress they will only wear once or twice, or to fashionistas who just want to change their look often. It has thus transformed the online retail industry by making designer dress rentals a convenient and accessible experience for millions of women. Special occasions like buying a new house, getting married or expecting a baby requires a celebration, and with celebrations come lovely gifts from friends and family. A recipient compiles a list of items they wish to receive and hands it out to their friends and family. A registry helps prevent gift givers from duplicating gifts. E-commerce stores should implement a ‘gift registry’ feature on their site to attract customers’ networks. A customer can upload a wish list on the eCommerce site; this list includes products available on the site, and friends and family can pick products from this list and buy them on the site itself. This feature will lend credibility to your brand and also improve sales. Amazon, an eCommerce giant makes it easy for friends and family of its customers to choose the perfect gifts for them by setting up gift registries. An email with a link to the registry is sent to friends and family. The site also helps users send ‘Thank You’ cards once gifts have been purchased. 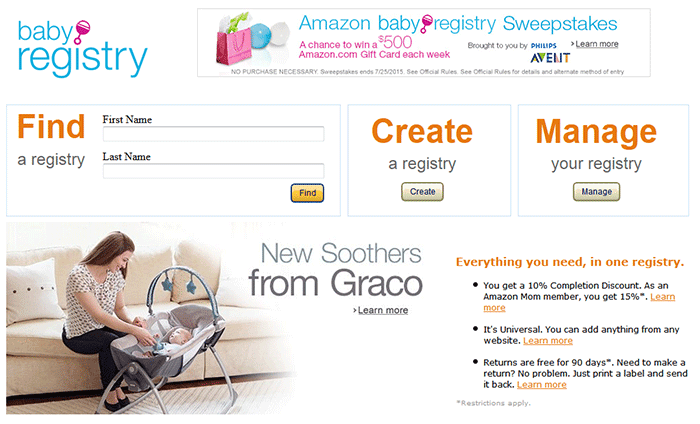 Amazon offers an innovative feature called ‘Universal Registry’ that allows customers to add items to their registry from any website. Social networking sites like Facebook and Twitter are an almost ubiquitous part of people’s lives. The social networking boom is in full swing with more and more people actively joining these sites every year. E-commerce stores should leverage these social channels to increase revenues and boost sales. Featuring social proof prominently on your website is essential, but it’s equally important to make it easy for your customers who already love your products to share their likes with others. Online retailers should incorporate social sharing buttons on product pages allowing shoppers to post and share product ‘likes’ with friends and family. Eventbrite, an online ticketing service, is making excellent use of this feature. When visitors book tickets to upcoming concerts or conferences using Eventbrite, the website prompts them to share their purchases via social media. Customers can also find out through Facebook which of their friends are attending these concerts. Social proofing is a smart marketing tactic in both online and offline retail. When shoppers are in a situation where they are unsure of the product they should buy from the various available options, eCommerce stores should provide them with a cue by reflecting others choices. Book Depostitory.com, the UK’s largest online bookseller, captures all activity taking place on site. 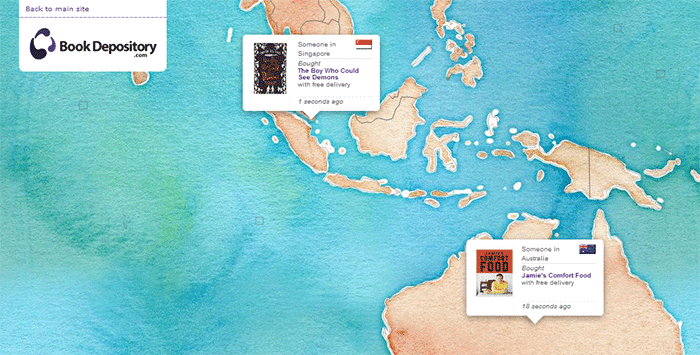 It has a great live feed on Google Maps which shows people around the world placing orders for books. It allows visitors to share the page with their social networks on platforms such as Facebook, Twitter and Google+. Gift cards are one of the most popular gifts given, especially around the holiday season like Christmas or Valentine’s Day. 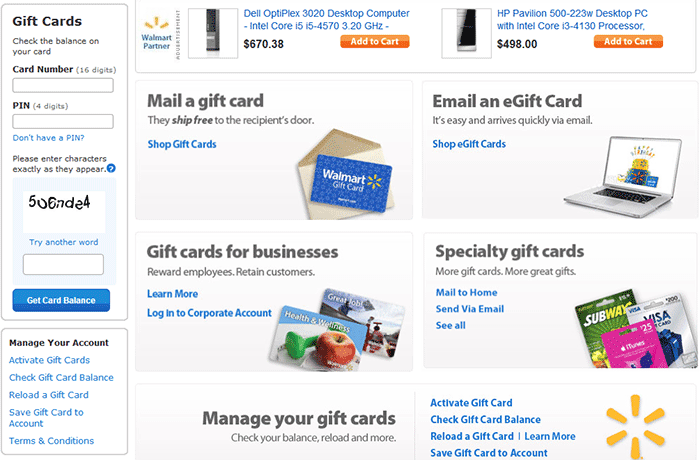 Brands should offer the option of gift cards on their websites to increase brand visibility and build customer loyalty. § In the US, 41% of consumers tried a retail store, restaurant or hotel for the first time because they received a gift card for that business. § 72% of consumers tried a business for the first time because they received a gift card returned to that business. § 70% of consumers spend more than the value of the card. These stats prove that gift cards can be an effective way to increase online sales, acquire new customers and encourage return visits. Walmart, for instance, offers an amazing gifting option which allows customers to send any item available on the site with a gift-wrap and a personalized message to friends or family. All eCommerce retailers are aware of the fact that visuals greatly impact shopping behavior. This is the reason why we find high quality product photos on all reputed eCommerce sites. But you can take it a step further by crowdsourcing pictures on Instagram. When visitors see images of other regular people using your product, they are more likely to buy. 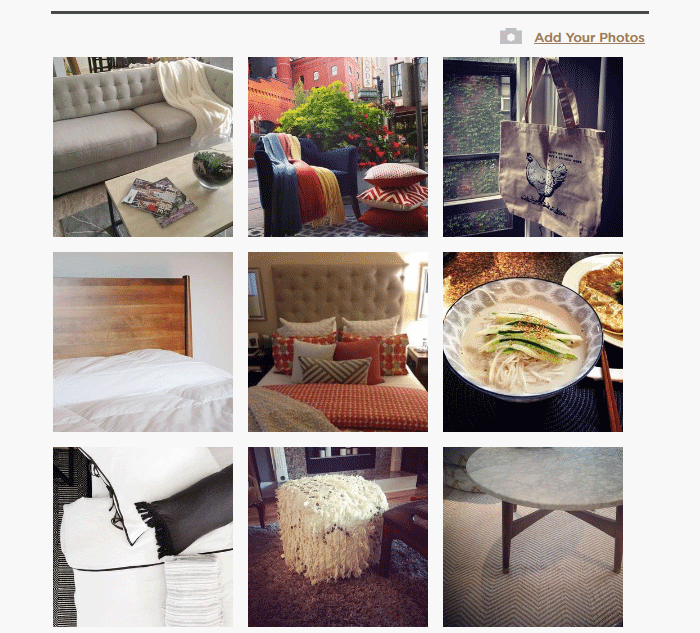 West Elm, for instance uses a service called Olapic, to curate a customer gallery. The best part about their galleries is that they integrate a link to the product into the customer’s description of the picture. After clicking on a photo, you can quickly ‘shop the look. The above mentioned sites offer some unique and novel features that ultimately help them increase their revenues. You can get inspired from these features and come up with innovative ideas for your eCommerce site to ensure it stands out from the crowd. Get Your Free Online Store On www.worldmart.in .